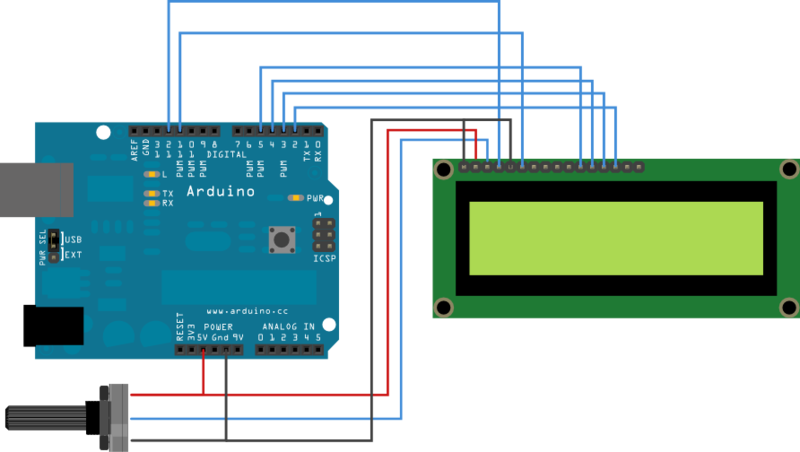 There are a lot of Twitter feed readers around the Web that use Arduino AND a PC to display twits on LCD displays or whatsoever. Then, I decide it was the time to design a solution for performing the same job WITHOUT A PC, and here's the project. Mount the Ethernet Shield on top of the Arduino board. You can find detailed instructions here. This is a little harder, but again you can find detailed informations here. The link contains also some sample code you can use to check that the connection work. Please perform this action WITHOUT the Ethernet Shield. Before proceeding to the next steps, you need to change a bit the schematics you find here. In fact, such schematics do not foresee the concurrent usage of the Ethernet Shield, which occupies pins no. 10-11-12-13 to communicate with Arduino. For this reasons, you should move the related connections (12 and 11) down to 9 (LCD RS pin) and 8 (LCD Enable pin). At this point, you are almost finished. However, before packaging I suggest that you make a preliminary test on your system. Third, you may need to wait some time to see the tweet (the sketch is programmed to read my own last tweet, if you didn't modify it). If it gives a connection error, try pushing the reset button on the Ethernet Shield to refresh the network configuration. On the LCD, you should get the title "Twitter2LCD" and then after some time (around 1 minute) the tweet divided into two pages. It'll continue updating every minute or so if you leave it on. If everything worked correctly, you can proceeding to the final setup and packaging steps. Otherwise, get back to step 1 and test connections and correct behaviour using samples on the Arduino website. Now you can freely adapt and configure the sketch to your needs. Once everything is finalized, you can think of a suitable enclosure. In my case, I used a balsa contained, which can be also hang on the wall! Packaging is relatively easy: if you select a box which can be opened, then fix the display on the top by cutting a suitable area and dig two holes for Ethernet and power supply. In the pictures, you can find my solution. Step 6: Step 6 - Have Fun! That's it. Feel free to send me your versions and suggestions, this doesn't pretend to be a complete solution, but a framework to work on and play with!!! Unfortunately due to Twitter stopping to support the RSS feed and the Arduino programming language developing, it would be necessary to update the code heavily..
can we replace the lcd display with dot metrix display? i have 2 unused 3612 sure electronic display. i just need to tweak the code a bit and adjust some connection right? anyone can help me with this? Can we use these libraries without using Arduino board?? or can you send any alternate library files for using without Arduino? works fine I modified the sketch to work well with 2x16 LCD but I have problem with Turkish chars. Is it because of LCD library or anything else? How can I correct it? Unfortunately, I don't know how to proceed. Maybe you'll need to check out whether there's some translator. I believe the LCD library is "tuned" to English characters. who's or what EthernetDHCP lib are you using with this code? As far as I can tell there isn't an official EthernetDHCP lib on the Arduino.cc site... the one I've found is: http://gkaindl.com/software/arduino-ethernet/dhcp is this the lib your code references? If I recall correctly, I used the Ethernet library on the Arduino website. I believe you should copy the EthernetDHCP folder directly in the library folder.